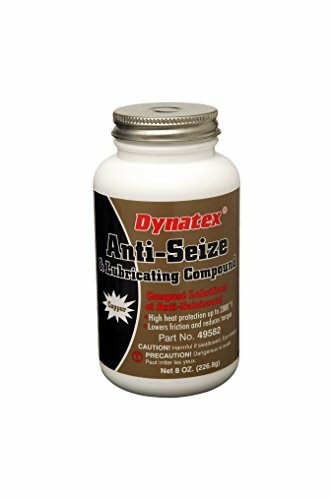 Dynatex copper anti-seize is a heavy-duty, economical industrial anti-seize and lubricating paste containing very finely divided metallic particles in a special no-melt petroleum base grease. Dynatex copper anti-seize leaves a protective film that seals and protects metal parts even under the most extreme conditions of heat, pressure, steam, and water exposure. Typical applications: spark plug threads installed into aluminum heads, exhaust manifold and engine bolts, oxygen sensors, knock sensors, thermostat housing bolts, fuel filter fittings, battery cable connections. Storage and shelf life: when stored in the original unopened containers at or below 90 degree F (32 degree C). Physical state: paste. Color : dark copper. Base oil : petroleum. Thickener: synthetic. Texture: buttery. Specific gravity: 1.27. N.L.G.I. grade:1. Flash point : 420 degree F. Suggestions of uses should not be taken as inducements to infringe any patents. ISO Certified.